"It was curiosity about polygamy that led me to pick up this book, but it is the author's craft at story-telling that made it impossible to put down. Kim's honest, riveting portrayal is both intriguing and inspiring. "...Mary Ann Cook, Author of Honey, I'm Home for Good! 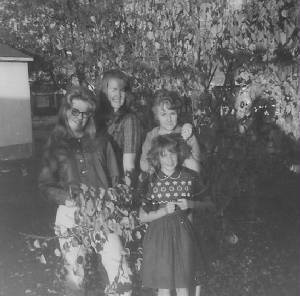 KIM AND HER OLDER SISTERS BEFORE LEAVING UTAH TO LIVE IN THE COLONY IN MEXICO. An odyssey of mayhem, murder, and tragedy is what Kim’s family unknowingly embarks upon in their quest for a peaceful existence in an unorthodox religious society. It is on a deceptively fine spring day, at the tender age of seven, that Kim is uprooted from her comfortable middle class home in Utah to be moved into a polygamous colony in Mexico. 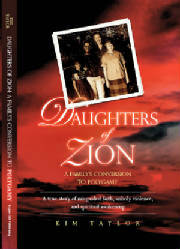 From that day forward her life takes dramatic twists and turns as, one by one, her older sisters become plural wives and Kim herself is eventually courted by the polygamist fathers of some of her good friends. Her relatively peaceful world is shattered when violence erupts within the ranks of the priesthood leaving her sister a widow, and Kim fears for her own life as some of her closest friends become murderers in the name of religion. In the end, her family is devastated by a tragedy of a more insidious evil. Available at Amazon.com or bookstore near you.